1 Preheat oven to 160C. Place pork shoulder in a baking tray, season with salt and and rub with Hellmann&#39;s smokey BBQ sauce. Pour apple juice in base of tray and cover tray tightly with foil. Cook pork for 4 hours. 2 Whilst pork is cooking, slice the potatoes into ½-inch slices, then cut the slices into ½-inch strips, wash in cold water, pat dry with kitchen towel and place the sliced potatoes on a baking sheet. Drizzle the olive oil over the potatoes and season with salt and pepper. Place in the oven for last 45 minutes of the 4 hour pork cooking time. 3 Remove cooked pork form tray &amp; shred meat using two forks &amp; reserve warm. increase heat of oven to 180C. 4 Remove chips from tray and place on an oven proof plate. Top with chips with the cheese mix, and place in the oven for 15-20 minutes until cheese is melted and beginning to brown. 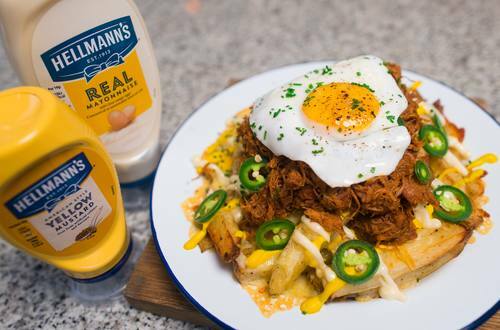 Remove from oven and top with Hellmann’s Mustard &amp; Mayo, followed by as much pulled pork as desired, reserving remaining pork for other recipe(https://goo.gl/Tb3oJb). 5 Top with a fried egg, fresh jalapenos and chopped chives.